New York Times bestselling author Nelson DeMille’s new novel (in stores September 19) features U.S. Army combat veteran Daniel “Mac” MacCormick, who finds new life in Key West as captain of his own 42-foot charter fishing boat, The Maine. After serving two tours in Afghanistan, he returned home with the Silver Star, two Purple Hearts, scars that don’t tan and a boat with a big bank loan. Truth be told, his finances are more than a little shaky. Mac’s bland, everyday charters are buoyed by covert adventure when he is asked by Carlos, a hotshot Miami lawyer heavily involved with anti-Castro groups, to make the journey to Cuba with an enigmatic exile and a young woman to uncover a stash of money hidden by an émigré from Castro’s revolution. Although wary, when the price reaches two million dollars, Mac finally agrees to meet Carlos’s clients — beautiful Cuban-American Sara Ortega and mysterious older Cuban exile Eduardo Valazquez. 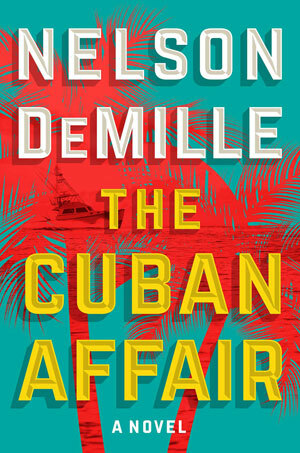 Mac learns there’s sixty million American dollars hidden in Cuba by Sara’s grandfather when he fled Castro’s revolution. With the “Cuban Thaw” underway, Carlos, Eduardo and Sara know it’s only a matter of time before someone finds the stash — either by accident or deliberate search. And Mac knows if he accepts this job, he’ll walk away rich… or not at all. Filled with authenticity from DeMille’s research trip to Cuba, The Cuban Affair deftly delivers a heart-pounding pace combined with the author’s signature humor. Published on August 28, 2017 in Literary Loop and tagged front by Kristy Johnson.